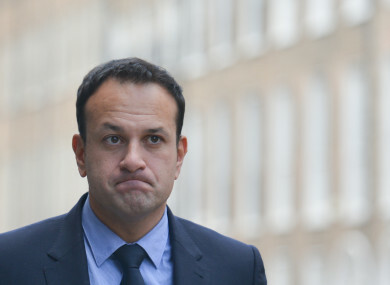 TAOISEACH LEO VARADKAR has suffered a blow to his personal approval ratings and support for Fine Gael has also fallen, according to a new opinion poll. The latest Irish Times/Ipsos MRBI opinion poll found that Varadkar’s satisfaction rating has dropped to 43%, down eight points from 51% last October. Despite remaining the most popular party leader, today’s figure is the lowest satisfaction rating he has ever received during his time as head of Fine Gael. Varadkar’s drop in numbers coincides with a three-point fall for Fine Gael since the last poll, with the party bringing in 30% support. In other party news, support for Sinn Féin has also dropped by three points. Sinn Féin leader Mary Lou McDonald’s satisfaction rating has also fallen from 40% to 33%. Support for Fianna Fáil dropped slightly by one point. Satisfaction with Fianna Fáil leader Micheál Martin has also fallen by 4% today from 39% to 35%. The government’s satisfaction rating has dropped marginally from 39% in October to 38% today. Looking further into the figures, the “core” vote for the parties (before undecided voters and those unlikely to vote were excluded) compared with the last Irish Times poll is Fine Gael at 21%, Fianna Fáil at 18%, Labour at 5% and Sinn Féin at 16%. Independents/others are at 15%, while undecided voters stands at 25%. Among smaller parties and Independents, the Green Party is at 2% among voters declaring a preference, Solidarity/People Before Profit at 2%, Social Democrats at 1%, Independents4Change at 2%, Independent Alliance at 1% and non-party Independents at 10%. Other groups and parties stand at 2% support. The poll was carried out on Monday and Tuesday of this week among a representative sample of 1,200 voters aged 18 and over in face-to-face interviews in all constituencies. The margin of error is plus or minus 2.8%. Email “Blow for Fine Gael as Varadkar's rating falls to lowest level during leadership”. Feedback on “Blow for Fine Gael as Varadkar's rating falls to lowest level during leadership”.